Government's Manchester threat | What Car? The Government is threatening to withhold 1.5 billion of public funding for municipal transport in Manchester unless the city agrees to the introduction of a congestion charge. Transport Secretary Geoff Hoon has said funding for new tram lines, extra buses and more trains would be cancelled unless a majority of Greater Manchesters 1.8 million residents voted in favour of the charge. Proposed transport improvements include a 22-mile extension to the Metrolink tram, improved bus services, 120 new school buses and the doubling of park and ride provision. 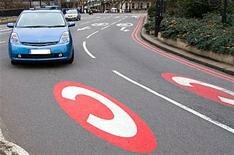 The improvements will cost 2.8 billion, with the Government signalling that it is willing to fund 1.5 billion through its Transport Innovation Fund, providing the other 1.3 billion is financed through the introduction of a congestion charge. However, opponents of the plan are accusing the Government of trying to bully the city into voting for a tax on commuting by car. Mr Hoon indicated that if residents voted against the introduction of the congestion charge then the money earmarked for Manchester would go to other cities. These include Cambridge, Bristol and Leeds, which are all considering road pricing to ease traffic congestion.